what cut will suit you? 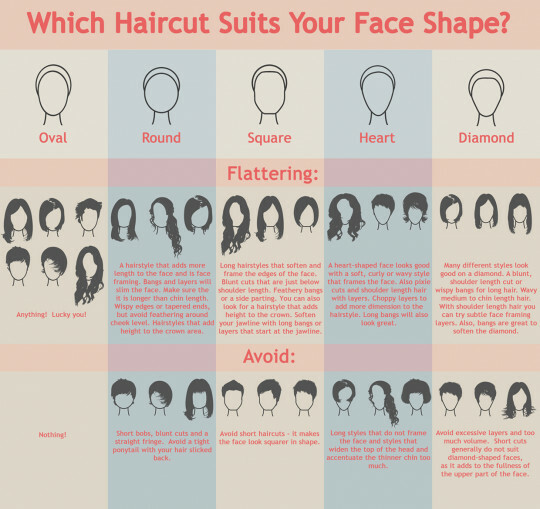 To find out your face shape, please see the picture above then choose the shape that best suits your face and take a look at the hair styles. Get the Haircut That Makes You Feel Good About Yourself The secret to looking gorgeous is really in one's attitude. The last thing you want to do is get a haircut that makes you feel unlike yourself. The basic rule of finding a great haircut for your face shape is never highlight your problem spot, and try to create the illusion that you have an oval face. This means if you have a round face, you may want to avoid short curly hair that makes your round face appear rounder. The better option would be a cut that hits below the chin or longer. If you have a square face, you may want to play down your strong, angular jaw. Texture, in the form of curls or choppy ends, does this brilliantly. Oval faces tend to look good in everything, but their faces can appear long, so think twice before adding height on top of the head in the form of a trendy, ginormous donut bun, a teased updo or a spiky short cut. And always consider your hair texture. If your hair is thick or curly, avoid a blunt cut or risk looking like a pyramid. Heart-shaped faces tend to come with pointy chins (think Reese Witherspoon). Draw attention to your eyes and cheekbones instead. For long face girls, while we should avoid long hair, we can get away with it if we cut in long layers that hit at the cheekbones and the chin. Long, wavy hair also looks good on us because the waves add width to the sides of a long face. One-length hair is great for super-fine hair, but doesn't work on everyone. Long layers are the key to the perfect haircut because they add body to flat hair, texture to thick hair and control to curly hair. Should You Part in the Middle or on the Side? Some women, particularly those with square face shapes, look awesome with middle parts. Hello Gwyneth Paltrow! But women with oval or long face shapes do not. You're better off with a side part.